I am not an artist, a graphic designer, a card manufacturer. I am a guy with Snag It, Google, and PowerPoint and a desire to see quality produced trading cards. "WOW! WOW! WOW! One Pack Chicle equals CUT SIG 1/1!! http://tinyurl.com/yg8bk2n "
Just because it has a full autograph of one of the mediums best directors, doesn't make it a nice card if it looks like this. Which would you rather have? The value is in the cut, I know, but does it have to look like crap? This is a perfect example of why there appears to be absolutely no pride of work, caring about what you produce, let alone creativity. If I could do this in 15 minutes with rudimentary software tools, can a career graphic designer on Topps payroll not do something even better? No, instead we have FrankenCutCrap. With everyone out there and their nifty design abilities, we should all band together and form our own card company. I think I'm onto something. 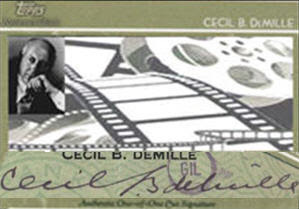 Because the sig is too long to fit on the card with a border of any kind; your cut would run the check right to the edges of the physical card. The only way it really fits is on the diagonal. Shouldn't that 'cut card' be in the Smithsonian? Seriously People!! I shake my head at these 'card designers' who seem to not have a clue! I'll join a new card company if professional sports leagues can get out of these stupide Exclusive agreements! Also, need a building high tech print machines! Maybe some assets will be available for sale later this year down in CA! I agree with Chris. I also don't think the signature looks too bad diagonal. 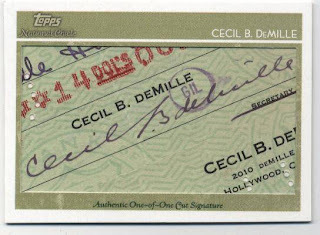 However I do think they could have designed it with pictures, including one of Cecil, above and below the diagonal signature. Actually, I like the first design better. It's more of the actual document, while your design is more "design" and distracts from the actual original signature and document. That said, in a perfect world, no one would be cutting these things up at all. It's a shame the document survived all these years to end up sliced and diced in a "manufactured collectible" card.